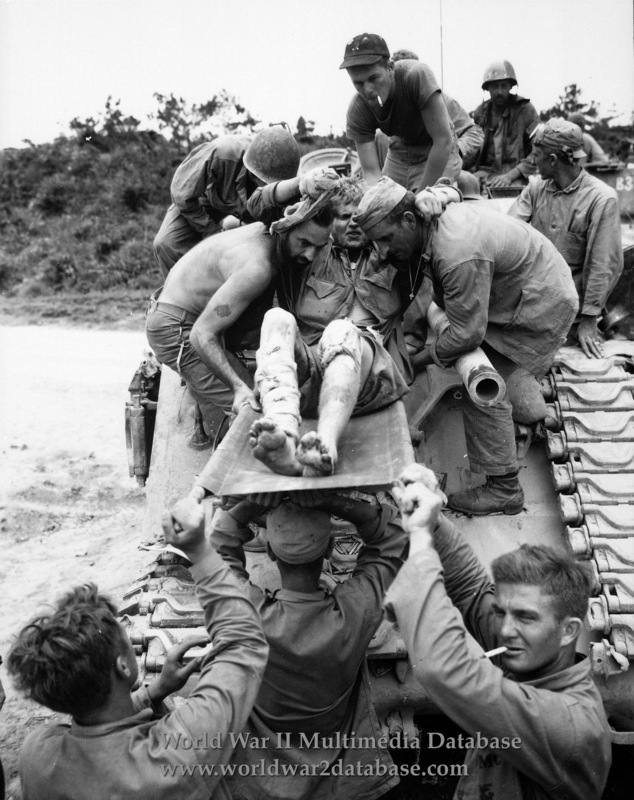 Private Warren D. Fuhlrodt (1925- ) of Blair, Nebraska, attached to F Company, 2nd Battalion, 1st Marine Regiment, 1st Marine Division, is lift out of an M4 tank of the 1st Tank Battalion after being wounded during the Battle of Kunishi Ridge. After taking Hill 69 on June 10, 1945, Kunishi Ridge was the next target for the 1st Marine Division, a steep, coral escarpment which totally dominated the surrounding grass lands and rice paddies. Honeycombed with enemy caves and tunnels, it was amply covered from behind by Mezado Ridge 500 yards (450 meters) further south. Remnants of the veteran Imperial Japanese Army's 32nd Infantry Regiment occupied and defended Kunishi's many hidden bunkers. These were the last of Ushijima's organized, front-line troops, and they had the firepower to knock out twenty-one Shermans before they were annihilated. Fuhlrodt was hit by an American white phosphorus grenade, either by a Japanese who found it, or by friendly fire. The phosphorus hit his back and legs, hard to put out and it burns more intensely in the proximity of aluminium and metal. With tanks the only vehicles able to survive the journey back and forth to the hospital under machine gun and sniper fire, he was told he could be evacuated — if he could get himself into the tank. So, he crawled, alone and unaided, into the bottom hatch, because snipers would fire on anyone accessing the top hatches. I doubt with severe burns to his legs, he could have climbed up top anyway, but he made it, covered in mud. Driven to a front line aid station, Fuhlrodt was evacuated from Itoman, hacked into the landscape, by Convair OY-1 Sentinel Grasshopper CASEVAC (Casualty Evacuation), strapped to the outside of the plane. In 11 days, the pilots of Marine Observation Squadrons VMO-3 and VMO-7 flew out 641 casualties from the Itoman strip. Suffering 500 casualties in the struggle for Kunishi Ridge, the 1st Marines were pulled out of the line that same day and relieved by the 5th Marines. Fuhlrodt received first aid on Okinawa and then was transferred by sea to a hospital ship, where doctors intended to remove his legs. Fuhlrodt refused surgery and was able to make a full recovery.